(Blogger’s note: Buying a car is a witch. I’ve spent the past two weeks scouring the internet, visiting used car lots and haggling like hell after the family mechanic told me that my beloved Mercury Tracer, Judy, was close to death. Today, I emerged from Bob Montgomery Honda [shout out] victorious. I said good bye to Judy and hell0 to Yoda the Toy0ta Corolla. Not only do I have a new[er] ride, but I will return to my normal blogging schedule that has been severely interrupted during the car-buying process. The Crunch salad from Chop Shop Salads. Kudos to reader greendrv for guessing the correct dish. I might not have ever known of Chop Shop Salads if the restaurant hadn’t built a respectable social-media presence. I’ve seen Chop Shop’s West Market Street location whenever I’m in the downtown Louisville area, but there’s only so much I can learn about a restaurant when I’m passing it at 25 miles per hour. It wasn’t until I began to follow Chop Shop on Twitter that I became interested in this fast-food salad concept. I can’t remember how I found Chop Shop on the social networking site (or if they found me), but it was a great discovery nonetheless. Chop Shop harnesses the sheer magnitude of the social media machine and uses it to drum up business (just look at this post — I’m several paragraphs in and I’m too busy talkin’ ’bout Twitter to even mention the food). The restaurant effectively engages its readers on Twitter by offering discounts on its menu of salads and wraps. During basketball season, for example, they would routinely ask fans to tweet in what team they wanted to win an upcoming game, and winning fans would receive $1 off their order. They also send out tweets encouraging Facebook and Twitter followers to come into Chop Shop, pull up the restaurant’s Facebook or Twitter page, and get a $1 discount on their order. The former promotion is what brought me to Chop Shop for the first time. With my iPhone pulled up to display Chop Shop’s Twitter page, I visited the Market Street location during my lunch break. Chop Shop takes the idea of a salad bar and amps it up to an 11. The menu offers a selection of restaurant-created salad creations that start at $5.49 and increase depending on ingredients. Chop Shop has some interesting combinations, such as the Tijuana Pool Boy with shrimp, feta, corn and black beans ($8.99); the Cowboy Club with grilled steak, bacon, goat cheese and sunflower seeds ($9.29); and the Handsome Rob with steak, chicken, four types of peppers and fried onions ($9.29). There are also more classic salad options such as cobb ($8.99), Greek ($7.99) and Ceasar (begins at $5.49). If you don’t like what the restaurant has put together, you can build your own salad starting at $5.49 with a wide variety of greens, meats, cheeses, protein, fruits and veggies. Need a more portable meal? Any salad can be made into a wrap, which cost less than the salads. For my lunch, I selected The Crunch salad that includes iceberg lettuce, tequila lime chicken, cheddar, corn, black beans, red onions, tomatoes and tortilla strips ($7.69). Per the recommendation of the menu and the nice guy building my salad, I selected the Green Goddess dressing. Watching the Chop Shop employee assemble my salad took me back to the first time I ever visited Subway as a kid. I remember the joy of standing on my toes and looking over the glass partition to watch firsthand how my order was made. The same thing happens at Chop Shop, only with more theatrics. Salad Guy (my name, not theirs) dumps the ingredients into a bowl, gives it a toss and gets to chopping with some kind of knife instrument that I’ve only seen in my nightmares. It’s dizzying and more fun than salad building probably should be. 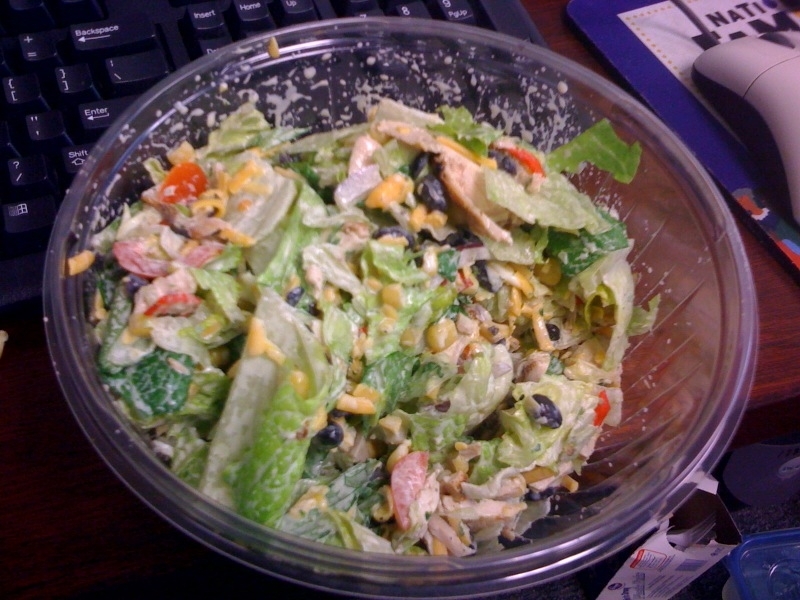 After paying for my food (including my $1 discount), I took my salad back to work to enjoy at my desk. The Crunch was a tasty version of a southwest salad that a lot of restaurants offer. But the Green Goddess dressing really set the whole thing off. It was creamy with a hint of avocado, a good flavor to match with the tang of the tequila lime chicken. The chicken was well flavored, and there was a good portion of pieces spread throughout the dish. I loved the crunchy corn and beans, as well. Next time, I might ask for the dressing on the side when I order to-go, because my lettuce starting getting sogging on the ride from Chop Shop to my office. Salads also come with a sliced tortilla, which was kind of bland, but suitable if you want some carbs with your salad. Nobody told me that a salad could be that filling. It might seem silly to pay almost $10 for a salad, but Chop Shop loaded mine with lots of toppings. I started got bleary-eyed as I inched toward the bottom of the plastic bowl. So much produce, so little time. I’m eager to try Chop Shop again, especially with the variety of salads and willingness to offer deals through social media. Take note, restaurants — engage your audience, and more business could come your way. I’ve been reading that Chop Shop is going to bottle and sell some of their dressings. Heck yeah. If you visit the Market Street location, park on Jefferson Street and walk. Don’t expect to park close, especially not during lunch hour. Chop Shop Salads, 436 West Market Street and 126-D Breckenridge Lane, Louisville, Ky. Pretty fine article. I just stumbled upon your web site and I’d like to say that I have really enjoyed reading your posts. I’ll be subscribing to your feed anyway and I hope you’ll post again soon. Big thanks for the useful info.